Every fleet owner, especially a business fleet owner wants their selection of cars to be smart and professional. It can be very difficult to find attractive looking cars that are also fuel efficient and cheap. However, Auto Express have put together some of the best executive cars of 2015. Most of us believe that executive cars are compiled of the German Big 3 but nowadays there is more competition, including smaller compact vehicles. All the top vehicles selected by Auto Express are cars that boast space, performance and cheap running costs for businesses. This 3.0 litre V6 Diesel executive car costs around £48,835, is based on the Quattroporte and is the first diesel engine car that Maserati have produced. The engine is diesel meaning the car will be cheaper to run however it doesn’t compete with its rivals when it comes to quality. Critics have said the engine is quite noisy but enthusiasts argue that when the sports mode is turned on the Active Sound generator makes the engine produce a fantastic rumble. Lexus have gone in a different direction to their competitors with the IS saloon; it is not the nicest car to drive however it has a smart look and fits in with other executive cars. This car is the first hybrid technology car in the IS range and is powered by the Lexus Hybrid Drive. The 2.5 litre, four cylinder engine gives of only 99g/km of CO2 emissions and due to having no diesel the car attracts a lot of company car buyers. This new IS has updated its suspension to make it 20% firmer meaning it has excellent grip and stability at corners. The car costs £29,995 and is great for low city speeds however if you want to get performance out of it you will notice its acceleration is sluggish and the throttle is very lazy. The 2.2 litre diesel has recently seen CO2 emissions cut meaning it is more appealing to company car buyers. The executive car is a slick and sophisticated looking car and is different to the German models that rule the executive car sector. However even though it is a great looking car, the interior touch screen and navigation technology is rather dated. The car boasts quick, well weighted steering and is great for winding country roads. Its downfall is the soft suspension which causes body roll. It is not a comfortable car to drive at slow speeds but it does improve as you speed up. The Jaguar XF will cost you around £32,945. Costing £31,795 this BMW combines the look of the 4 Series Coupe with the practicality of a hatchback and class of a 3 Series. The car handles very well and. 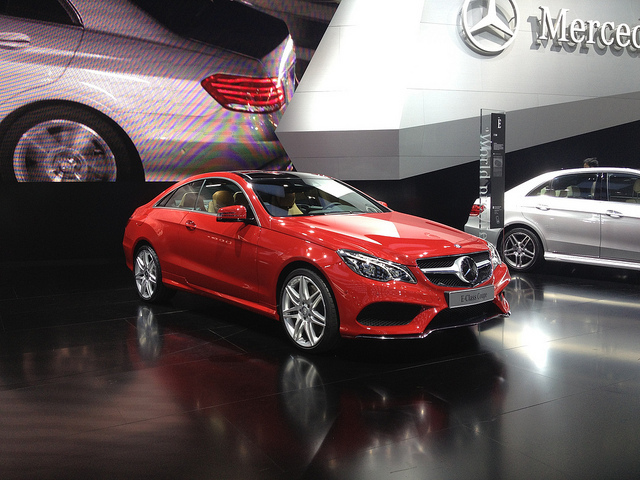 due to its 50:50 weight distribution, the Gran Coupe is well balanced while staying flat in speedy direction changes. The car has a 480 litre boot which is the same as the 3 Series saloon and 35 litres bigger than the 4 Series coupe. The Mercedes E Class was introduced in 2009 and is one of the older cars within the class, although the S-Class did have an update in 2012. Auto Express recommends the smooth driving E350 BlueTEC in AMG line trim as they weren’t keen on the E220 models manual gearbox. With a massive 540 litres of boot space, the car is very practical and great for business car owners. The interior of the car is spacious, fitting five adults comfortably with a generous amount of leg room. The Mercedes E Class will cost £41,210. Audi have bought out a low-CO2 Ultra model which will appeal to tax-conscious company car drivers. The new Audi has had its exterior updated as well as its infotainment system and is agile when driven due to its aluminium structure. The S line models have lowered, stiffer sports suspension and larger wheels mean the A6 doesn’t travel comfortably over potholes. Auto Express’ preferred model is the A6 Ultra with the 187bhp 2.0 litre TDI motor. This car returns 67.4mpg and emits only 109g/km. It comes as no shock that the BMW dominates the best executive car of 2015 thanks to its impressive efficiency and low emissions. The 3 Series is well known for its great handling, agility and balance when driving down winding back roads. The car’s interior is perfect for a business car with spacious cabins and lots of leg and head room. It also has a 480 litre boot for suitcases. The BMW 3 Series costs £28,775 and Auto Express picked the 320d ED SE model. Overall, all of these cars are perfect for fleet owners. Which one is most suited to you, depends on how and where you will be driving it because they all work well in different ways. Looking for a Business Insurance quote? Get cheap business insurance deals on QuoteSearcher. Click and get on board for small business insurance quotes, just a simple form away!